Stories of Istanbulites, is a web-based interactive documentary that examines the identity of various neighborhoods in Istanbul through the participation of its residents. The project combines video portraits, photography, soundscapes, data visualizations, and community- generated content to bring these stories to life through an interactive online experience. 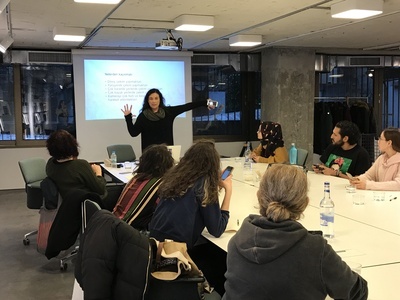 Bayar conducted several community workshops in Studio-X Istanbul for those who would be interested in participating in the project. After sharing some examples of interactive documentary from around the world, she demonstrated how to produce effective video ethnographies. Bayar, Tulu, "Istanbulites Tell their own Stories" (2018). Faculty Exhibitions. 20.